Comodo Rescue Disk is a free bootable antivirus program that checks for viruses, malicious registry keys, rootkits, and more before your computer even starts up. 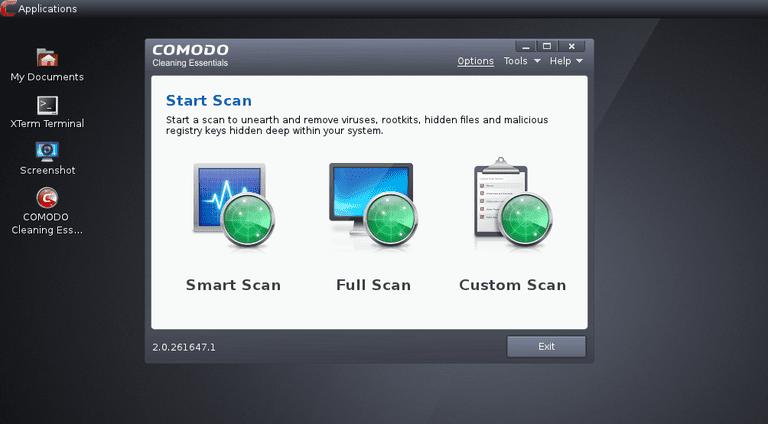 The program interface for Comodo Rescue Disk resembles the same desktop experience you're familiar with, which means using the program is as easy as with any other. This review is of Comodo Rescue Disk version 2.0.275239.1. Please let me know if there's a newer version I need to review. Click the "Download Comodo Rescue Disk" link at the bottom of this review to get to the download page for Comodo Rescue Disk and get its ISO image file. This is the entire program contained in one file. Once you have the program downloaded, you must burn the file to a disc. If you need help creating the bootable disc for Comodo Rescue Disk, see How to Burn an ISO Image File to a DVD, CD, or BD. After creating the disc, just boot to it instead of logging into the operating system. If you've never done this before, see How to Boot From a CD/DVD/BD Disc. This program is so easy to use once you've booted into it, that you'll think you're running a regular application on your desktop because that's basically what Comodo Rescue Disk provides. You can choose to Enter the Graphic Mode or Enter the Text Mode when Comodo Rescue Disk first starts up, but I recommend the graphic mode for a more familiar interface and an easier way to navigate the menus. I say above that Comodo Rescue Disk has different scan types. What I mean by this is that you can run a Smart Scan, Full Scan, or Custom Scan to scan different areas of the computer. For example, with the Custom Scan option, you can scan individual files/folders instead of checking the whole hard drive, which can save loads of time if you already know what you're wanting to scan. With that being said, the way you add files and folders to the scan queue makes for quite a long wait because you must browse for the location each time. Normally, with such an option, you can place a check mark next to each folder or file you want to scan, but Comodo Rescue Disk doesn't provide such an easy method. Don't get me wrong, though, it's still a very useful feature to have, especially considering many other bootable antivirus programs make you scan the whole hard drive without the option to check particular locations only. Although Comodo Rescue Disk will automatically try to update itself before starting a scan, you are able to skip it if you don't wish to wait for it, which is a nice feature to have if you're in a hurry.